Most people have heard about the rotary engine being used in the Mazda RX-7 and RX-8 sportcars and in some cases you may hear the term Wankel engine as the rotary engine was invented by Felix Wankel. Although this engine operates in a different manner from the regular engine, it is still an internal combustion engine and carries out the 4 strokes which is Intake, Compression, Power and Exhaust. The up and down movement of the pistons in a regular engine create the circular movement on the crankshaft which eventually moves the car. In the rotary engine, the rotor itself spins in a circular motion as it performs the four strokes to move the car. The rotor is 3 sided similar in shape to a triangle with all three sides and corners sharing the same length and angles respectively. The rotors is mounted in a housing shaped similar to an oval. The housing and rotor is designed in such a way that at any given point in time there are three spaces or cavities as the rotor spins. the image on the left is the rotor and housing, the area in the picture with the smallest cavity is where the compression occurs and the air/fuel mixture is ignited to continue into the power stroke. Every time one of the cavities rotates it is given the air/fuel mixture through an opening in the wall of the housing (intake), it compresses the mixture against the wall of the housing (compression), the mixture is ignited while it is compressed which aids the rotor in it's circular motion (power) and the burnt mixture exits through an opening on the wall of the housing (exhaust). The intake and exhaust openings are close so as a cavity pushes out the exhaust gases it starts another cycle. 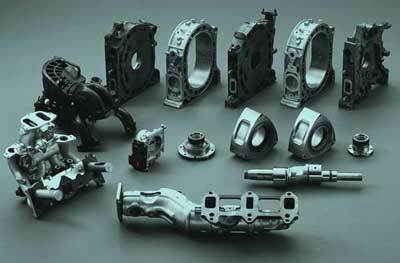 An advantage of the Wankel engine is its power output for its size. The engine in the Mazda RX-8 has 1.3 liters of displacement, yet it produces 252 horsepower (thats more horsepower than the 2.0 liter Wolkswagen GTI) and 159 pound-feet of torque. The main parts of the Rotary engine. 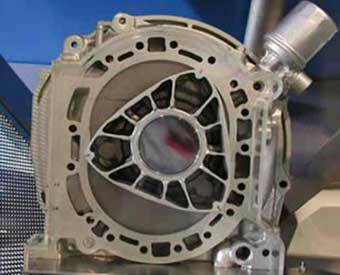 The rotary engines used on cars have 2 rotors separated by a housing plate. The rotary engine is lighter and more compact than a regular piston engine and avoids most of the complexity as there are only 3 moving parts as opposed to the over 35 moving parts in the piston engine. The drawbacks to this engine are manufacture costs tend to be higher and its not as popular as the piston engine. When a loss of compression in a piston may just cause a miss in a piston engine, loss of compression in one of the cavities will affect the other cavities of that rotor throwing off the entire 4 stroke cycle.